These golden jewels are popping up in woodsy areas in the Pacific Northwest, in Minnesota, in Europe, really anywhere relatively north, and smart foragers are snapping them up, some to land in their own sauté pans, and some to go to market. Chanterelle mushrooms (aka girolles in French and pfifferlingen in German) are considered to be among the “foolproof” wild mushrooms. None of the dangerous ones look remotely like them, and “false chanterelles” (barely edible and not worth the trouble) are a different color configuration. They are also considered to be among the most choice: tender but firm in texture and with a unique flavor which is enhanced with a little heat so they are best just barely cooked. Most chanterelle seekers will do best to check out farmers markets or upscale grocery stores, albeit not the cheapest way to find them, but the most reliable if you don’t know where to look. MyMEGusta had the pleasure of harvesting these little beauties near Duluth, MN, a few years ago at a location she won’t divulge (thus respecting the mushroom hunters’ code of silence). 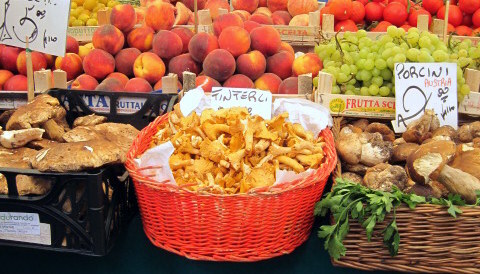 European food lovers are very fortunate in that the custom of focusing on seasonally special items is alive and well. Chefs’ creations run the gamut from traditional favorites (e.g. 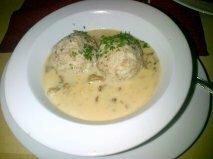 a hefty portion of pfifferlingen served with herbed cream and semolina dumplings recently at the Ratskeller in Regensburg, Germany) to more exotic offerings in three star restaurants. I fondly remember my first encounter with this intense focus on seasonality at lunch time in Munich, Germany in the 80’s, happily working my way through a plate of pfifferlingen in cream. And, on another trip, another time but in France, “salade tiede” (warm salad) which was mounds of barely cooked, lightly seasoned chanterelles on a bed of lettuce. These mushrooms are so beloved in Europe that their name has been borrowed for a little mechanism used to shave Tete de Moine (monk’s head) cheese in Switzerland, because the cheese then resembles them. Lovely…and brought to mind a wedding luncheon in a Geneva garden with lacy white tablecloths, silver, champagne, and a first course of a chanterelle salad which was truly amazing! Can we find them at Fairway, perhaps? Yes, Fairway might have them, and you could also try Balducci’s and Whole Foods. Or move to Minneapolis or Vancouver and you could find them in the farmers’ markets! 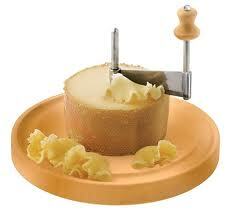 Just curious, What is the name of the mechanism that shaves the tete de moin cheese? Is it Ratskeller or Rathskeller? Which is correct? I believe the tool is actually called a girolle! Both terms for “city hall cellar” are correct, apparently a regional thing.